This monthly magazine offers competition reports, news about junior events, along with instructional tips and coaching information. This link opens an index page with 30+ articles by Gary Anderson, DCME. Topics include: Introduction to Marksmanship, Sight Adjustment and Zeroing, How to Practice, Rimfire Sporter and much more. This 10-page PDF guide teaches prone, standing and kneeling positions to new shooters. Contains dozens of photos and illustrations. This 32-page booklet for owners of CMP rifles includes safe gun handling rules and safety guidelines along with tips for rifle operations and maintenance. This 20-page booklet, written for junior air rifle shooters, provides safety rules, procedures and guidelines. This is for coaches to use with the Rifle Safety and Marksmanship Training CD. Right-click and “save as” the links below to download these Powerpoint presentations to your computer. These can be used in a classroom/seminar setting, or can be reviewed by shooters on their own. NOTE: Clinking a link will initiate the download to your default download folder! Principles of Marksmanship, by Gary Anderson, DCME. This is an outstanding presentation well worth watching. Not just for juniors. Mental Training, the Triangle of Success, by Mark Taylor. Not just for juniors, this presentation can help all shooters improve their “mental game”. How to Run a Successful Camp or Clinic, by Michele Makucevich, Rhode Island CMP State Director. This presentation is appropriate for clubs or youth groups. Gary Anderson, DCME, has authored a great book on instructing junior shooters. This full-color, 200-page treatise is probably the most comprehensive marksmanship coaching guide in print. The author, Gary Anderson, knows something about high-level competition — over his illustrious career he captured two Olympic gold medals, won seven World Championships, set six world records, and held 16 national titles. In this book, Gary provides coaches with all the tools and techniques needed to help young shooters (and novices) improve their skills. Packed with useful illustrations, this 200-page book sells for $19.95 plus S&H through the CMP E-Store. These illustrated books, written by U.S. Army Marksmanship Team personnel, provide detailed instructions on the basic and advanced skills of High Power service rifle shooting and service pistol and bullseye pistol target shooting. The books cost $6.95 each through the CMP E-Store. Share the post "CMP Resources for New Shooters and Juniors"
50 years ago today, October 15, 1964, Gary Anderson (now CMP Director Emeritus) celebrated his Gold Medal victory at the Tokyo Olympics. Gary earned Olympic Gold for winning the 300m rifle event. A few days later, Gary’s team-mate, Lones Wigger, won a gold medal for the USA in 50m rifle competition. Photos from CMP Archives. Follow the CMP on Facebook. Share the post "Blast from the Past: Tokyo Gold, 50 Years Ago Today"
CLICK HERE for Video Showing 2014 National Matches First Shot Ceremony. This year’s National Matches started with a military theme. World War II aircraft flew overhead, a WW II Sherman tank rolled past the spectators, and cannons fired. The National Matches are a joint effort of the Civilian Marksmanship Program, the National Rifle Association, and the Ohio National Guard. The National Matches were were first held in 1903, and have been conducted at Camp Perry since 1907. 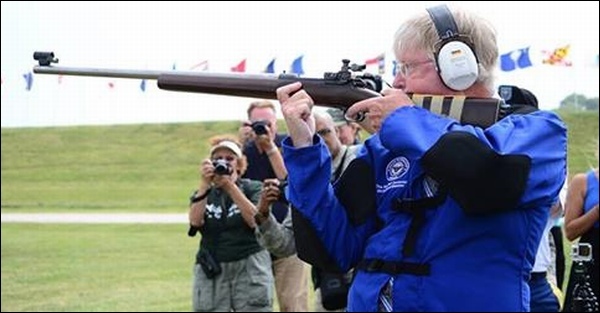 After Anderson fired the first shot, he donated his Model 70 rifle to the Civilian Marksmanship Program. Share the post "2014 National Matches Commence with First Shot Ceremony"
In November, the ISSF Administrative Council approved new ISSF rules calling for major changes in ISSF and Olympic Shooting Sports events. Starting in 2013, all Finalists will start with zero scores and there will be elimination rounds, ending with a final two-shooter duel for the Gold medal (the loser of the duel gets Silver). The new Finals procedure represents the ISSF’s first major format change since the introduction of finals in 1986. The new Finals format will be used in all 2013 ISSF Championships. This rules were changed to make shooting events more “spectator-friendly”, attract media coverage, and engage a larger fan base. It is hoped that the new format, ending in a duel, is more appealing and easily understandable. The new ISSF rules contain new Finals formats for all Olympic shooting events mandating that ALL finalists start from zero. This means that qualification scores will not be carried into the Final anymore, making the scoring system immediately understandable for spectators. Furthermore, all Finals feature eliminations, and end with duels between the two best athletes to decide the gold and silver medals. The new 2013 Rules have been published on the ISSF website, ISSF-sports.org. The new ISSF Rules also include the separation of sighting and match firing in 10m and 50m rifle and pistol events, a new position order for 50m Rifle 3-Position events, and a provisional test of decimal scoring for 10m Air Rifle and 50m Prone Rifle events. The Final for the 50m 3-P Rifle event will become a true 3-Positions Final, not a one-position Final like it used to be. And new time limits will require shooters to make more rapid position changes in future 3-position rifle Finals. Both 25m Pistol Finals will use hit-miss scoring to encourage more spontaneous spectator reactions. “The shooting sport has always been a leading sport in the Olympic movement. And with the new finals we made an important step forward to keep that leading position,” said ISSF President, Mr. Olegario Vazquez Raña. Share the post "New ISSF 2013-2016 Rules: Finals Start from Zero, and End in Head to Head Duel for Gold"
On Monday, 11 July, the 2011 NRA National Rifle and Pistol Championships officially commenced at Camp Perry, Ohio. DCM Emeritus Gary Anderson led a procession of special guests into the ceremony. Poor weather cancelled the traditional delivery of the colors by a parachute team, so the flag was presented to Anderson by a squad from the Ohio National Guard. VIP Guest Joseph Westphal, Under Secretary of the Army, addressed the gathering, and then Westphal fired the ceremonial First Shot, followed by wounded warrior SFC Sene Polu, who fired the second shot. Now that the championships have begun, each morning the National Matches start with a bang — a big bang. With the raising of the colors, a cannon is fired in salute. On 12 July, Mike Krei, NRA’s Director of Competitive Shooting was chosen to fire the cannon, marking the first day that shots are going down range at the NRA National Pistol Championships. We are now into the second day of competition in the National Pistol Championships. It’s day two of the NRA National Pistol Championships, and that means competitors are firing the NRA Preliminary Pistol Championship today in three separate relays. In this morning’s first relay, shooters took to the range to complete the Center Fire, .22 Caliber, and .45 Caliber stages of fire. The aggregate of these stages comprises each competitor’s total score. Who are the front-runners? SFC Jim Henderson of the Army Marksmanship Unit won this Championship last year with a score of 890-42X, but the record of 894-50X was set by Brian Zins in 1996. At this stage in the match it’s too early to tell who the winners might be, but with 10-time National Champion Brian Zins sitting out this year, there may be some surprises. James Lenardson, SSG Jean-Noel Howell, David Lange, and SSG Patrick Franks are just a few of the competitors who are riding high after yesterday’s Revolver Matches, but Philip Hemphill, SFC Henderson, John Zurek, and many others could still finish on top of the podium. Story by Kerrin Brinkman and photos courtesy the NRA BLOG. Share the post "NRA National Championships Commence at Camp Perry"
In addition to the Gary Anderson article, this month’s edition of On the Mark features extensive coverage of Collegiate shooting events, and the National Junior ROTC Championships. Share the post "Latest Edition of ‘On the Mark’ Available"